The staff at FT wishes everyone a Merry Christmas! 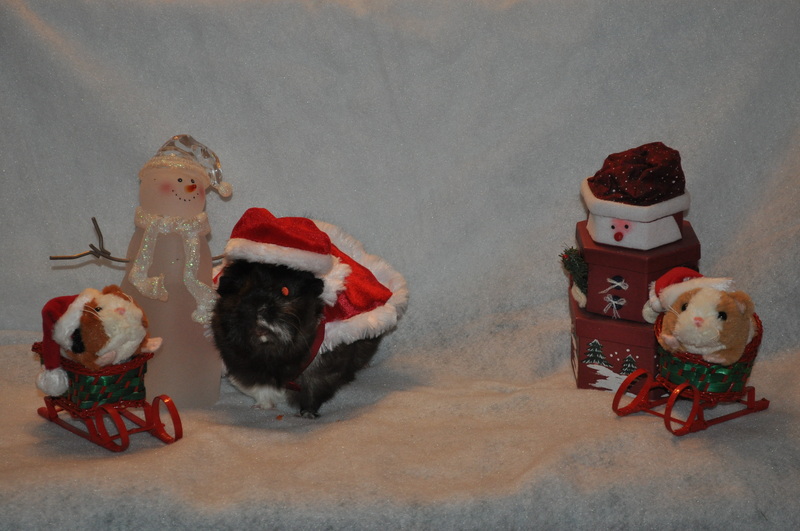 Chewy is Mrs. Claus, TaunTaun is Santa in the sleigh, and Fizz is the Reindeer. 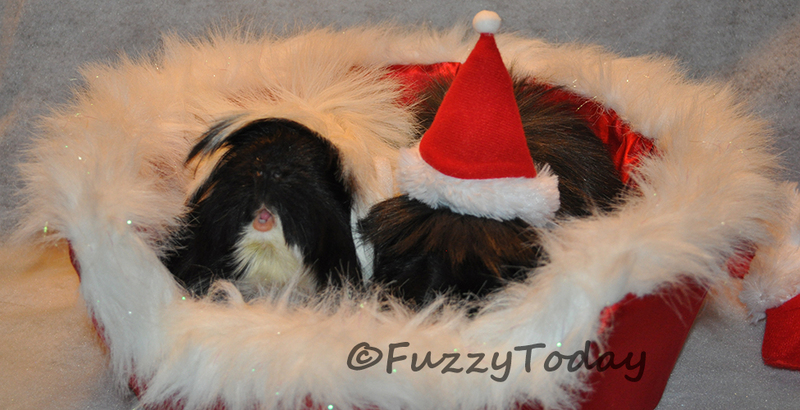 The staffers were kind enough to wear their hats for about a minute while the human took lots of shots. 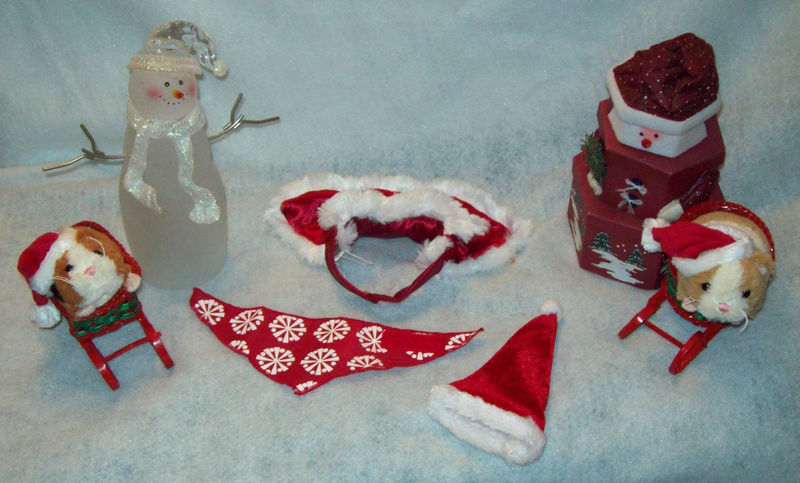 The Santa hat, Mrs. Claus costume, and antlers are from Petsmart. The harness the human made from felt and yarn, and it just sat on Fizz’s back. The background was added in Photoshop. 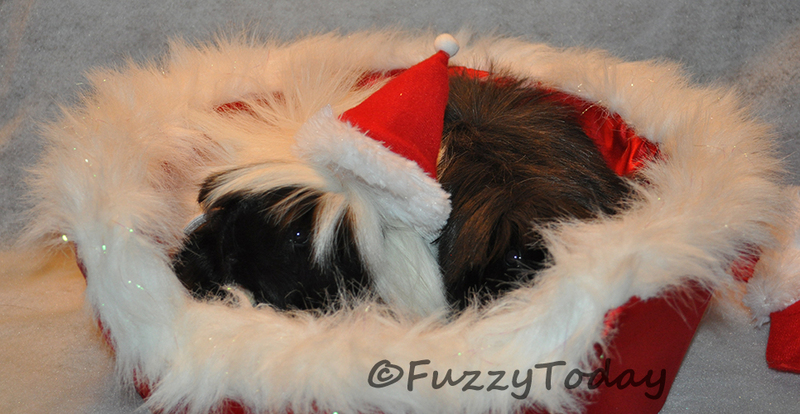 The Santa scene is a composite of two different shots – one good one of the interns and one good one of Fizz. The human made an attempt to get the whole group together for a single picture but that was quite ambitious, and she still had to put two different shots together. We hope that you have a Merry Christmas! Hope everyone is having a great Christmas Eve! Maybe you will see Santa with his reindeer flying through the sky. So fluffy and sweet looking. 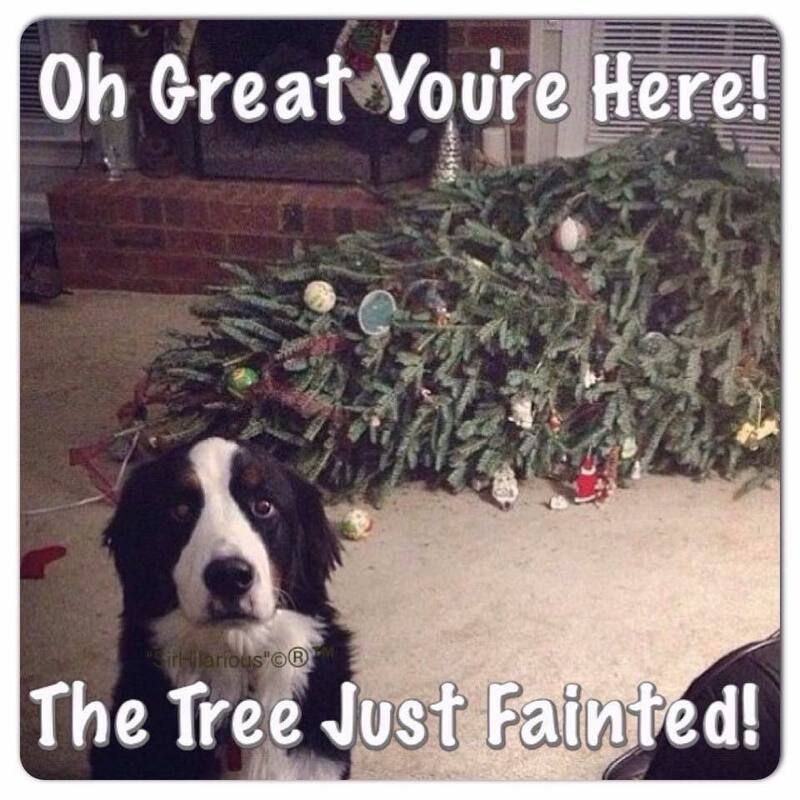 Pets and decorations don’t always mix very well, make sure you take any necessary precautions to protect your pets (and your stuff). We all know what really happened here! 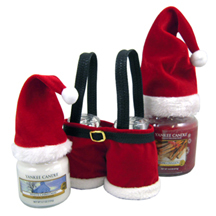 Have you started to decorate for the Christmas season yet? Good luck! 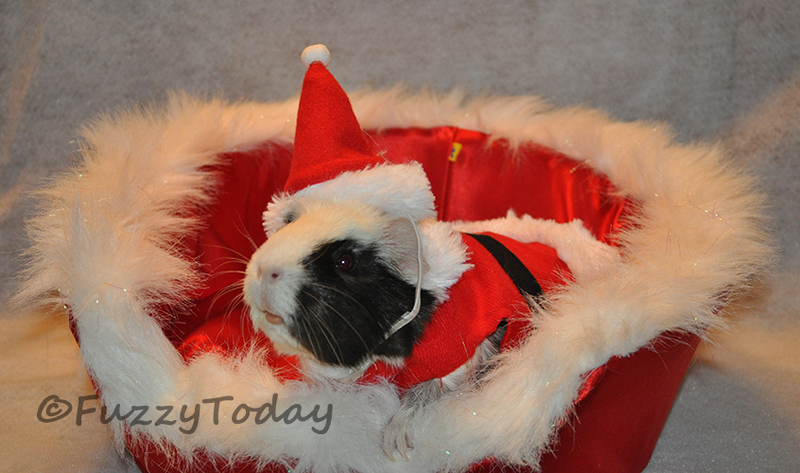 This year the staff here at Fuzzy Today took some Christmas pigtures we want to share. I know, but they wish to remain anonymous at this point because they do not take photos very well. They came to me at almost two years of age and cameras are not their thing. Our fur blends in very well with the fuzz around our bed, we love it! Yes, we did wear the costumes and hats – for about one minute! Long enough to get pictures while munching on carrots and then be off into floor time with more treats. 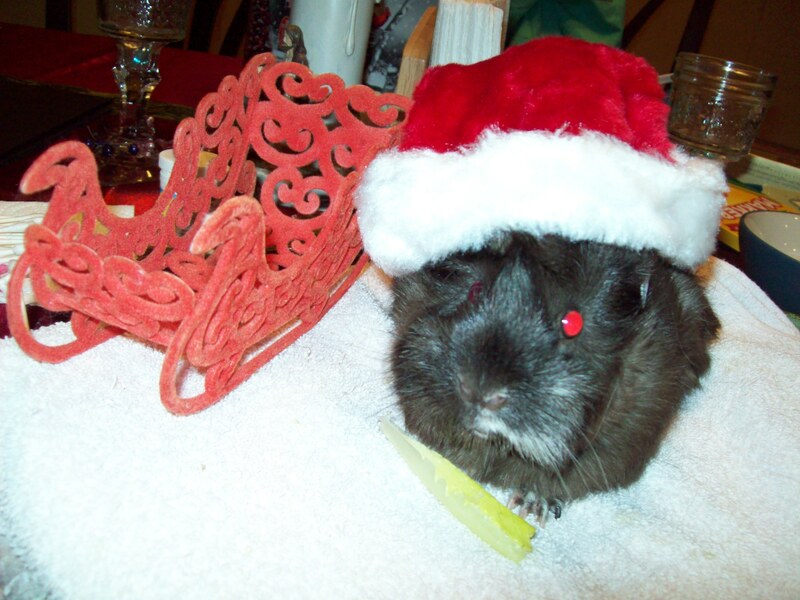 Yesterday I posted my Christmas card picture and explained that my guinea pigs cannot be together because they fight. 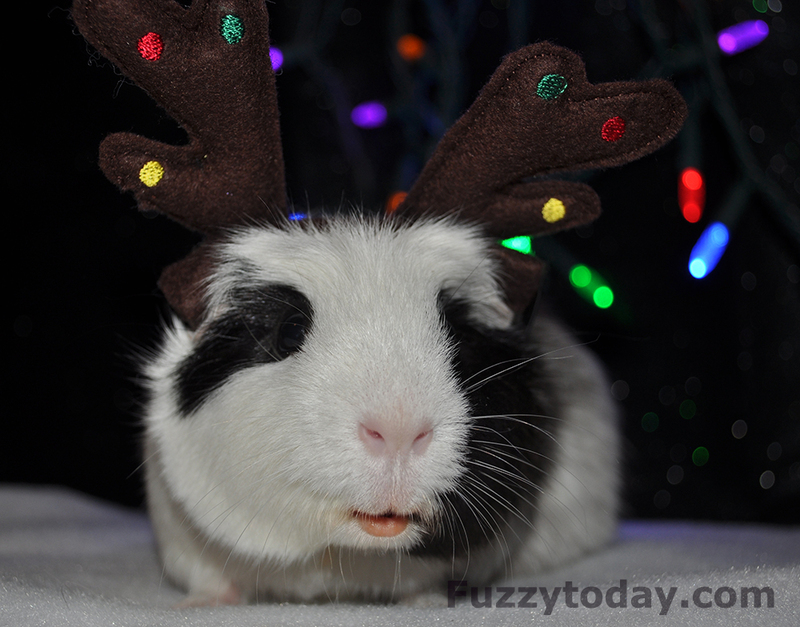 Today I will share more of the pictures I took and show the making of my Christmas card. I had my camera on a tripod so I could prevent as little movement as possible so the frame would line up. 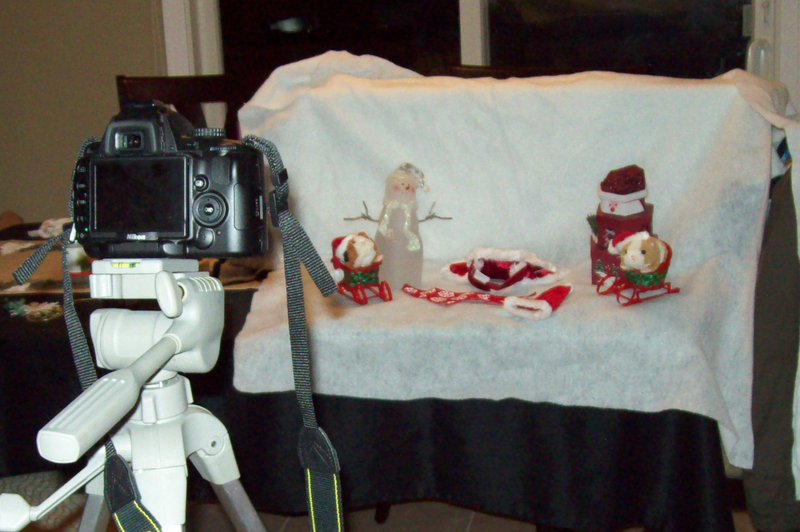 I used a roll of fabric snow set up on the dinner table with a box behind to create the background. The dinning room does not have the best lighting, but I do not own any photography lights and it would not have made much of a difference anywhere else in the house. We had to get the cards made in order to be printed in time to mail, so I did not have time to make a more elaborate or interesting scene. 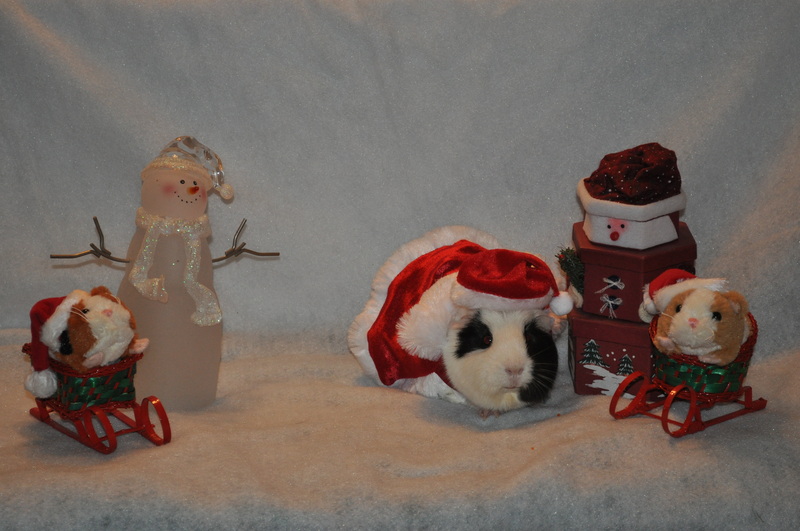 I took two snowmen off my bookshelf and arranged the two sleds with stuffed Christmas guinea pigs next to them. 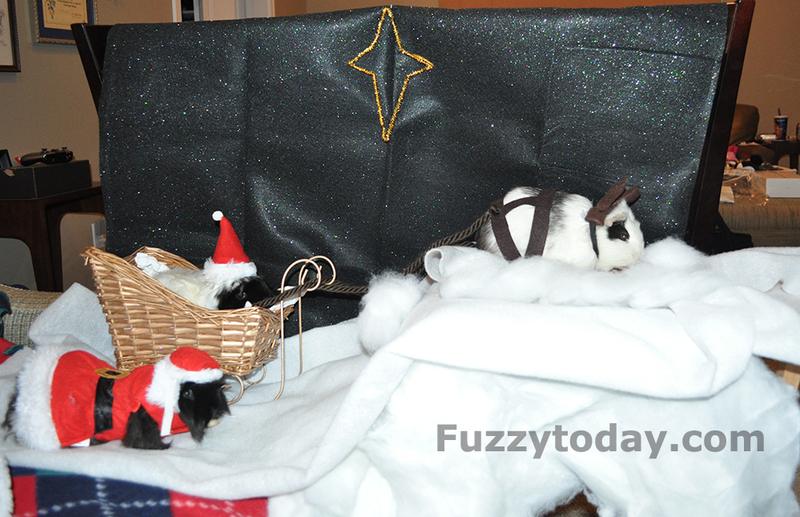 The wicker sleds I got when I was a kid, and the stuffed guinea pigs were gifts last Christmas. 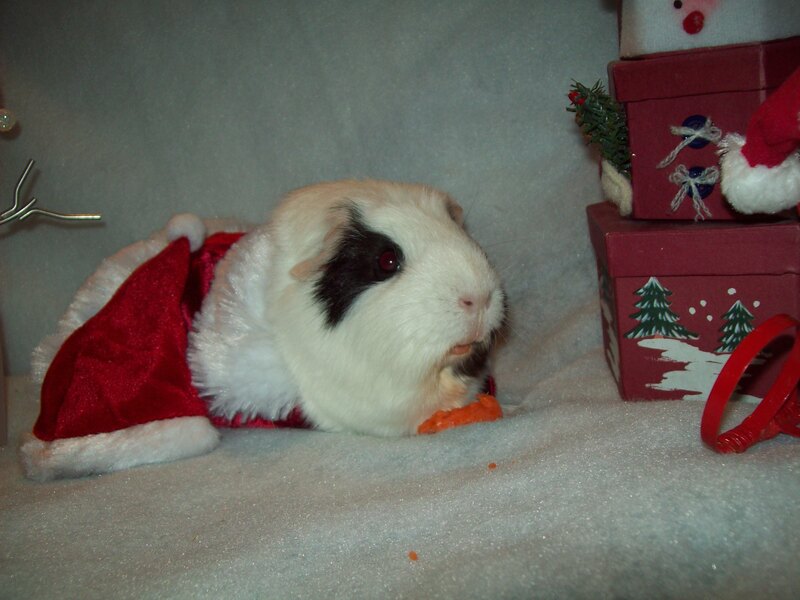 The holiday cape and bandana came from Petsmart, and are Life’s Fur-tas-tic! brand. The bandana ended up being too small to fit, so it was not used. 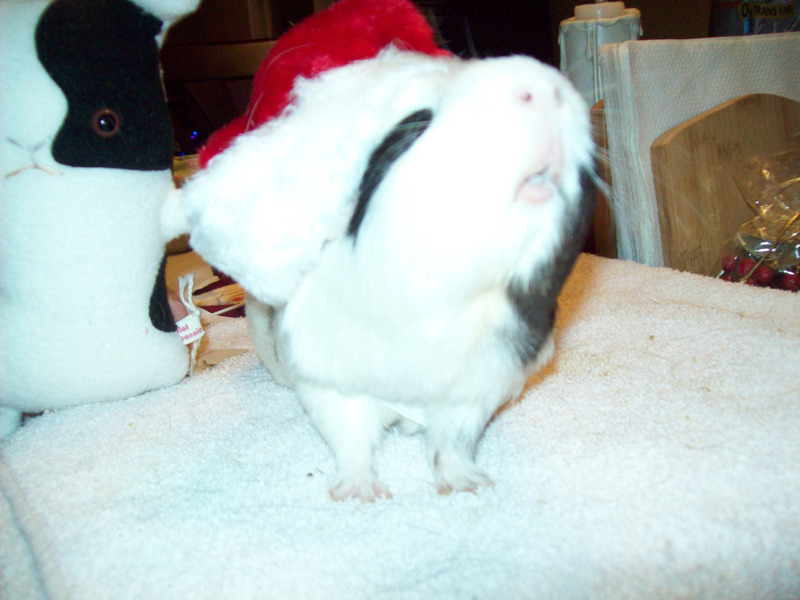 Each guinea pig wore the one hat and dress individual and I took a few different pictures hoping to get something useful. Well, it is the second day of Christmas, so Merry Christmas! 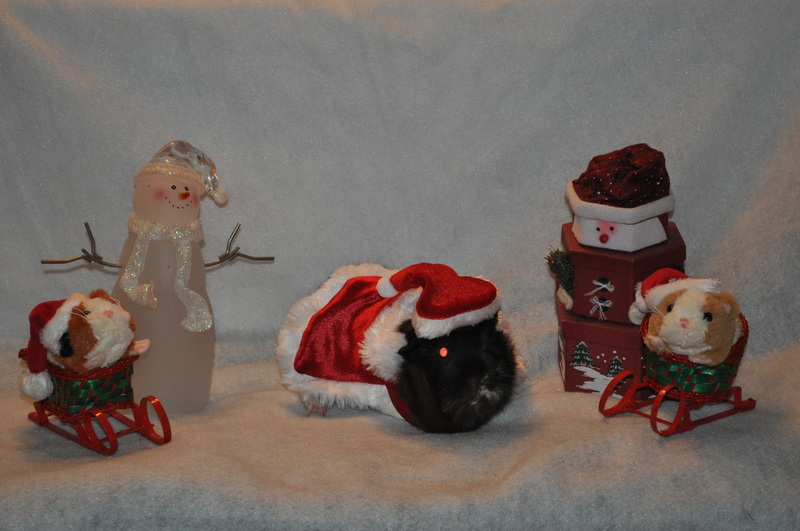 My guinea pigs posed for the camera this year to feature on my Christmas cards. Cola and Fizz cannot be together because they fight, so they had individual photos taken and photoshop put them together. I can post a series of photos on what that looked like another day. 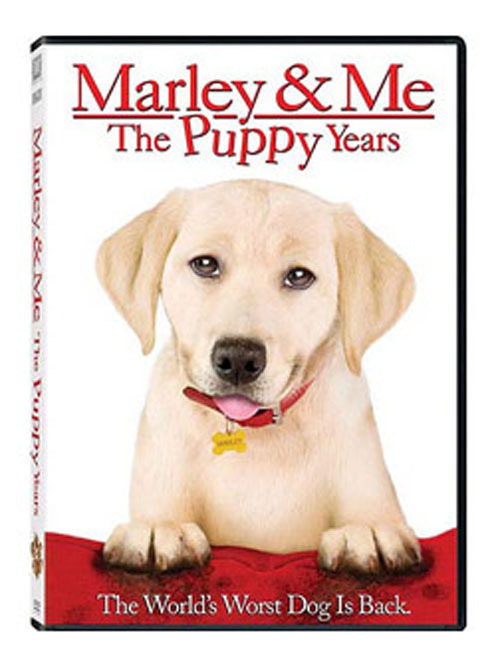 After previews long since appeared on dvds for a movie featuring Marley, from Marley and Me, while still a puppy the movie is finally coming out this week. 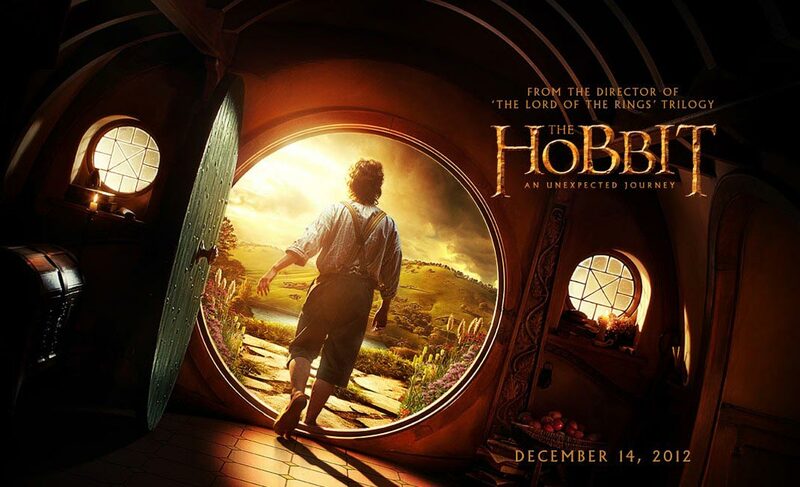 The movie will be in stores as of 1/3/2012. It was known previously under the names Marley and Me the Terrible 2s, and was supposed to come out last year. Best Buy’s ad for the week features a picture of the bluray of the movie with a price of $7.99. The website has pre-orders for the dvd for $4.99, and a two disk edition for $9.99. Pre-order them, or order them tomorrow, on bestbuy.com. 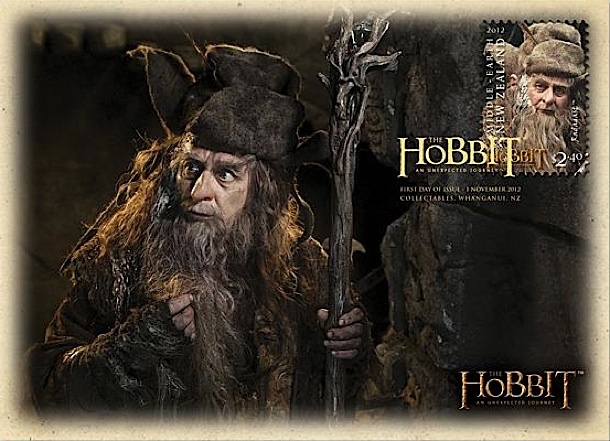 Walmart is selling the DVD on its website for $13.99, for an exclusive widescreen version. See it here. From our family to yours, please enjoy this wonderful season with your family and friends! 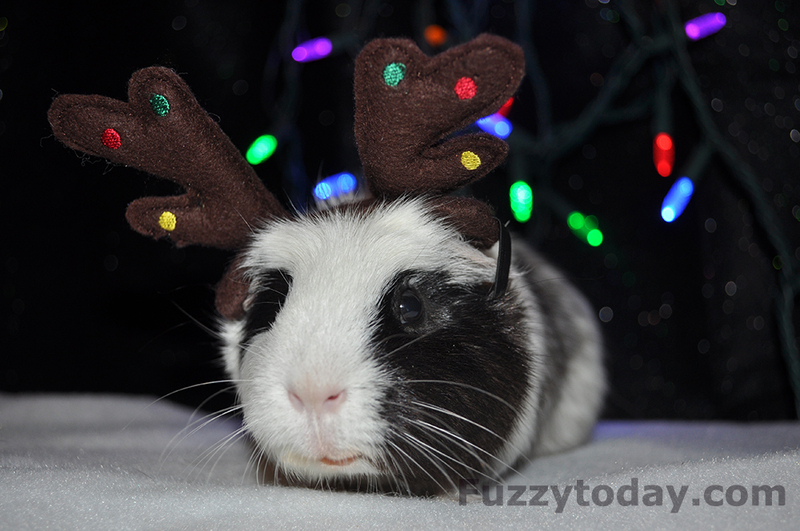 Late last night I saw a news article that spoke to the success of Reindeercam.com. 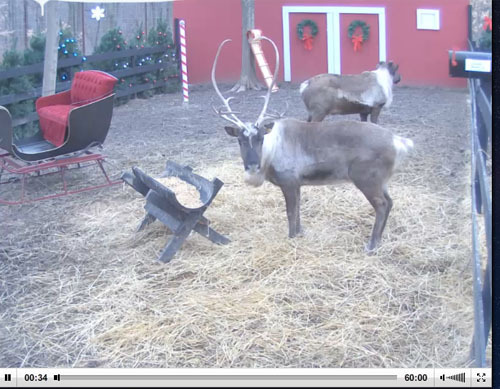 It is a webcam where you can watch a couple reindeer go about their day, and you can see Santa come to feed them at 10am and 5 pm EST! The camera is on all day and night, and is an awesome opportunity for kids to see these amazing animals. The reindeer with antlers is actually female, male reindeer drop their antlers come December. 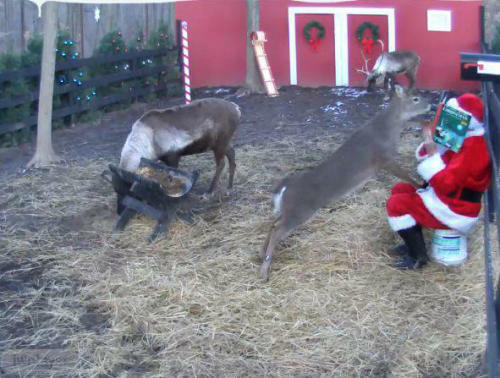 The makers of the site have a camera that features the white tail deer they raise and decided to create this cam when a friend suggested they do something for Christmas. They did not expect it to be so popular, so sometimes the servers become overloaded. But it is worth watching for a bit if you get the chance. It has been viewed by people in over 126 different countries. 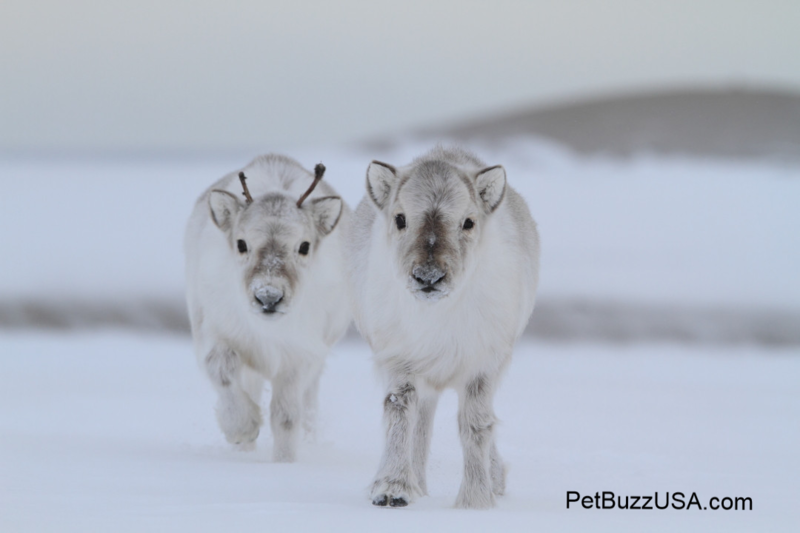 Go to Reindeercam.com to see them in action! Here is a time when Santa was visiting and reading the Night Before Christmas, also pictured is a tame white tail deer. You can read an article about the site here. I am sad that I did not know about this before now because the cam will be turned off after Christmas until its return next year.